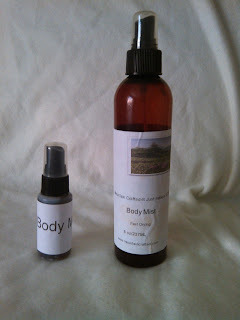 Mountain Crafted: Body Mist prices have been permanently lowered! We are excited to now be able to offer you our luxurious moisturizing body mist in our convenient 1 ounce and 8 ounce sprayers at lower prices. This proprietary mist is wonderful for use after bath application. Our proprietary 1 ounce bottle of body mist is excellent for when you are traveling and need an instant burst of refresher. Our 8 ounce bottles are excellent for keeping in the bathroom for full body application after bath. Also works great when lightly applied to hair, it help to add sheen and luster. This body mist leaves your skin smooth and silky feeling. It is not sticky or oily feeling, the instant it is applied you can feel the silky sensation of your skin. Then will follow the wonderful fragrance. 8 ounce was $10.95; now only $8.95. We were able to obtain the base for this product from our supplier at bulk rates and can now pass on the savings to you. Go ahead and pamper yourself with this body mist, you deserve it!